in more of our favorite summer looks! A fellow Kentucky girl, Laura Kirkpatrick was a finalist on Cycle 13 of America's Next Top Model and has been modeling professionally all over the world ever since. But Laura is much more than a pretty face. Always staying true to herself and where she comes from, Laura has also launched a successful business right here in the bluegrass! As a local Kentucky business ourselves, we always love learning about and supporting fellow Kentucky businesses. We were so excited to have this opportunity to visit Laura's farm and collaborate together. 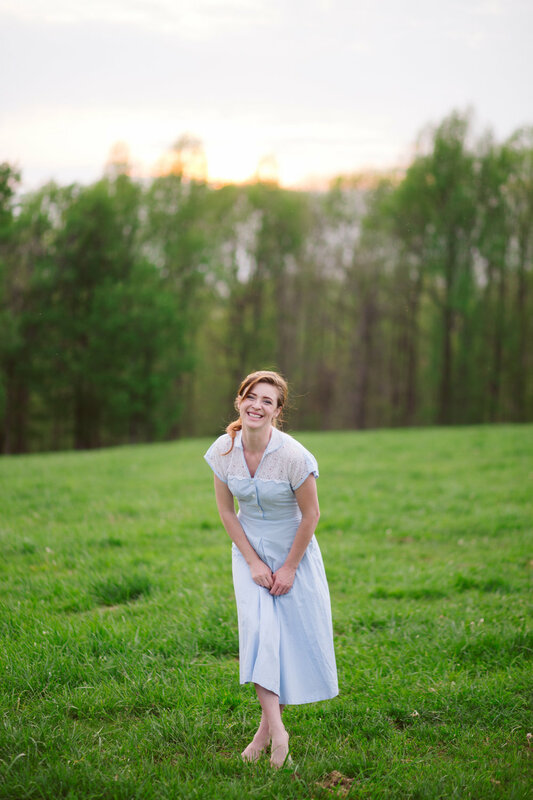 We hope you enjoy seeing Laura model our favorite summer dresses in her element as much as we enjoyed capturing them! 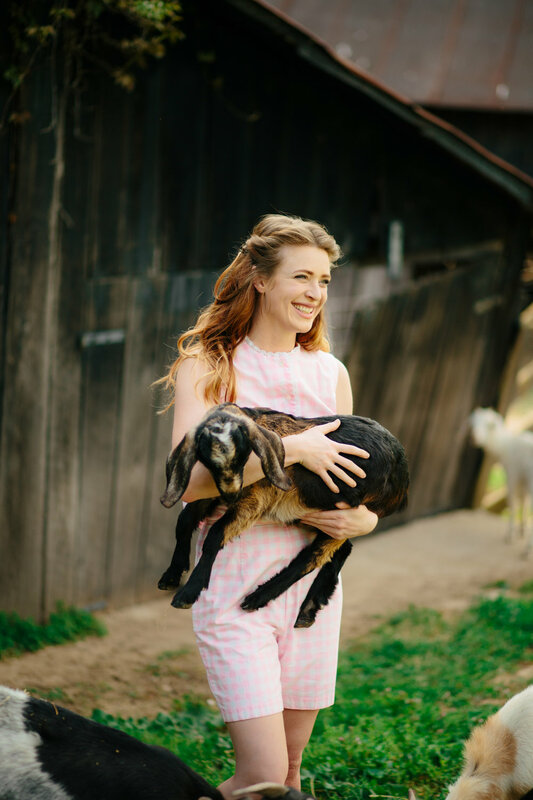 Keep reading to learn more about Laura's life on the farm and her business, Kentucky Darling Meats! I HAVE HUGE GOALS FOR HELPING FARMERS AND MY KENTUCKY HOME- IT'S MY PASSION. Laura & her father Greg started Kentucky Darling Meats together. Their business is all about family and providing consumers with a quality product, but Laura doesn't want to stop there. This Kentucky girl has even bigger dreams. "I’m passionate about food and buying local. We raise antibiotics free, no added hormone beef that is on the pasture every single day! We wanted to make a quality product and raise beef humanely. We also take pride in educating the consumer. The marketing industry has royally screwed up phrases like all natural which makes it hard for the consumer to know what they’re actually getting! We encourage questions and for people to come to the farm. We hope to get in to agriculture tourism to inspire our youth to farm, garden or just take a hike. I could go on & on… I have huge goals for helping farmers and my Kentucky home, it’s my passion." Laura is wearing our Cream Linen Dress with Cut Outs. This dress is available in store for $56.25. TO HAVE THE BEST OF BOTH WORLDS. Talking with Laura and discussing her life as a model and farmer it's very easy to see how passionate she is about what she does which is so inspiring. She knows it's all about balance, but ultimately she wants to be the best she can be no matter which world she's in. "I am often torn between my two lives. I do well balancing them, but there’s always something in the back of my heart pulling me between modeling and farm life. I do both, but I'm always pushing to have the best of both worlds which is a lot of pressure!" Laura is wearing our Vintage Blue Dress with Eyelet Panel. This dress is available in our online shop for $50. IT GAVE ME A HUMBLE FOUNDATION FOR LIFE, AND NOW I APPRECIATE THE WAY IT HAS SHAPED ME IN LIFE. Although Laura makes life on the farm look glamorous and effortless, it's not always the easiest lifestyle. "I don’t play with babies all day, and the weather is not always ideal. A lot of my child hood was spent driving post in the ground for fence, but today I know I can work my hardest and get through anything because not much is harder than physical farm work. But there’s emotional work people don’t realize as well. We see the full circle of life, and there’s hard times on the farm like drought or unexpected disaster. You have no choice but to face it and work through it and I dealt with all of that as a kid. It gave me a humble foundation for life, and I now appreciate the way it has shaped me in life. I appreciate our blue collar workers that are often looked down on. I appreciate food, and in America we are so spoiled and used to having whatever we want- and for cheap. We will never know famine. When you grow your own crop you're so proud of it even if it’s not the perfect piece of produce because you know how much care and work was put in to it." Laura is wearing our Pink Gingham 2 Pc. Set. This set is available in store for $35. I HAVE SEEN SOME BEAUTIFUL PLACES, BUT I ALWAYS MISS KENTUCKY. Laura has had the amazing opportunity to travel the world as a model, but her heart is always in Kentucky. "All I wanted was to move to the big city and see the world and I DID! I have seen some beautiful places, but I always miss Kentucky. I still travel and love it, but I know now more than ever Kentucky is an amazing state. Our people is what makes it so wonderful we have both talent and kindness!" Laura is wearing our Vintage White Eyelet Dress with Embroidered Roses. This dress is available in our online shop for $40. Red & White Gingham Apron is available in store for $12. "In fashion it’s easy to be consumed by vanity and worrying about what you look like. I’ve always balanced that with my farm life. It’s a great escape and humbling outlet. I could never leave my farm behind forever." Laura is wearing our Blue & Green Plaid Dress. This dress is available in store for $30. All Beverage Jar is available in store for $18. Yellow Juicer is available in store for $12.